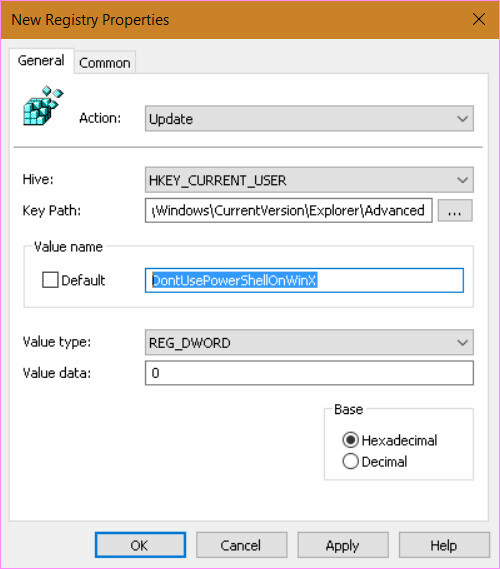 Beginning in Windows 8.1, you could set the Windows PowerUser menu (right-click on the Start button, or Win-X key) to show Windows PowerShell and Windows PowerShell (Admin) on the menu instead of Command Prompt and Command Prompt (Admin). But every single new machine you log on to, you had to change that. A nuisance, at least. So, I created a Group Policy Preference to set the registry key for this, and linked this to the Default Domain Policy. Apparently, Microsoft is finally catching up, and this is going to be the default on Windows 10 beginning with the build that's coming down today. About time! 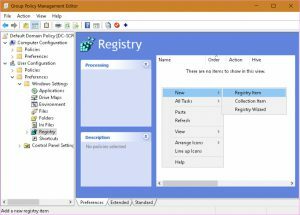 You can also use Group Policy Preferences to set that as part of a Group Policy Object (GPO). Expand the User Configuration container, then Preferences and select Registry in the left pane. 6. In the New Registry Properties dialog, select Update for the Action, HKEY_CURRENT_USER for the Hive, and a Key Path of \Software\Microsoft\Windows\CurrentVersion\Explorer\Advanced. 7. The Value Name is DontUsePowerShellOnWinX, with a Value Type of REG_DWORD and a Value Data of 0, as shown below. 8. Click OK, and then close GPEdit. The Group Policy will be applied to following the next reboot and logon of each user to whom the GPO applies. ETA, 3 August, 2016 -- this same problem exists in Windows 10/Server 2016. And the solution is the same. Set-NetConnectionProfile is your friend!